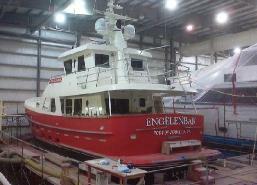 Launched in 2002, Engelenbak is an Ocean Haven North Sea trawler that was custom built by Alberni Engineering on Vancouver Island and was originally named Aleyska. The boat, originally conceived by Jon Allsop, was designed by renowned naval architect Greg Marshall. We purchased the vessel in 2009 and it was relaunched as Engelenbak in 2009 after repainting it fire engine red and refitting it with teak decks. The work was conducted by Platinum Marine in Richmond, BC. They did a top quality job ... and are a great group of people to work with. Engelenbak is constructed of welded steel that is plasma metalized to protect against rust. The superstructure is constructed of welded aluminum. Engelenbak also features a bulbous bow which modifies the way the water flows around the hull, reducing drag and thus increasing speed, range, fuel efficiency, and stability. A 14-foot Rendova hard-bottomed tender with a 50 hp engine sits on the forward deck. 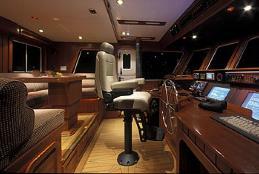 The interior features honduras mahogany and maple flooring. 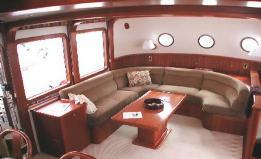 This includes three staterooms, each with private heads. 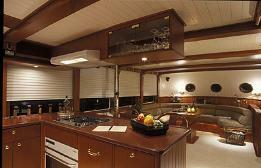 The galley is uniquely located on the aft main deck house with a pass-through window to the aft deck. The pilothouse features state-of-the-art electronics and is surrounded by a Portuguese flybridge forward and and an expansive deck aft.